Having recently posted a blog on dragonomics in Beowulf and Tolkien’s Hobbit, I decided to follow up by offering a complementary poetic translation of the Sigemund-episode in Beowulf. I have chosen to isolate the Sigemund-episode (874-902) and translate this passage as a discrete poem, in part because the episode operates as a poem within a poem, delivered as one of three songs by the Danish court poet and recited in celebration of Beowulf’s victory over Grendel. Numerous scholars have tried to identify its literary function in Beowulf, and the episode has traditionally been regarded as a heroic exemplum, honoring Beowulf and foreshadowing his fight with the dragon. I wish to challenge this reading of the passage. “The Sigurðr Portal” from Hylestad Stave Church, Setesdal, Norway; now housed at the Oldsaksamlingen of the University of Oslo. 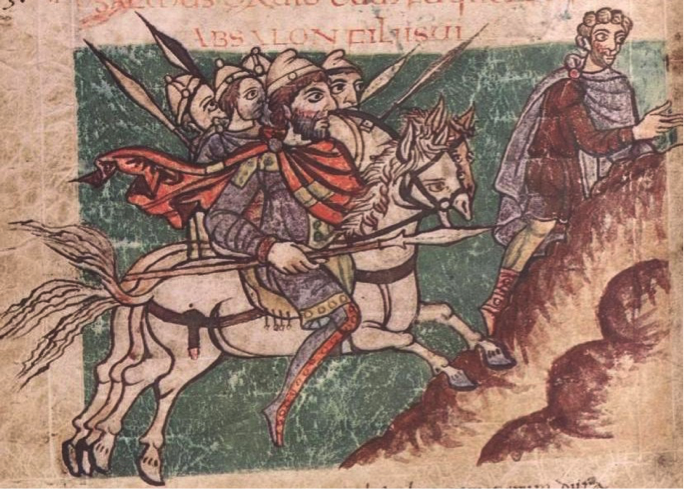 The Sigemund-episode in Beowulf is the earliest known account of the Vǫlsung legend, and this tale is alluded to in both the anonymous Poetic Edda and the Prose Edda of Snorri Sturluson as well as in Njáls saga, Þiðreks saga and the Vǫlsunga saga. 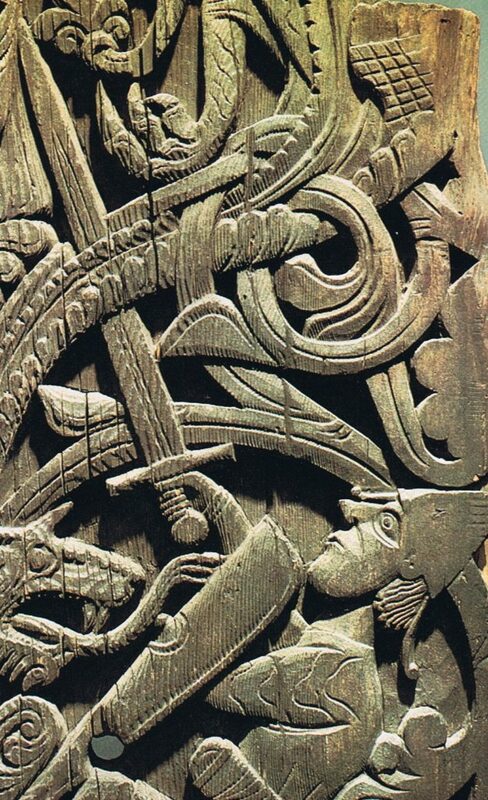 Christine Rauer notes in her study of the Beowulf-dragon and analogous medieval dragon-fights, “The more extensive accounts of the Vǫlsung dragon-fight, such as those found in Fáfnismál (Poetic Edda) and Vǫlsunga saga, date from the thirteenth century, although the subject matter can be presumed to be of an earlier date” (42). However, in these later Old Norse-Icelandic versions of the legend, it is Sigurðr, Sigmundr’s son, who is credited with slaying the hoard-guarding dragon, Fáfnir—not his father. I would note that, in the section in Beowulf describing Sigemund’s slaying of the dragon, there appears to be an alliterative formula that features also in the Old English Maxims II. This poem characterizes the behavior, function and stereotypical nature of various things—including references to cyning “a king” (1, 28), wulf “wolf” (18) and þyrs “giant” (42), in addition to geological features such as ea “a river” (30), wudu “woods” (33) and brim “sea” (45), as well as material objects and structures such as daroð “a spear” (21), beorh “barrow” (34) and duru “doors” (36). Maxims II describes sweord “a sword” (25) before shifting focus onto the stereotypical image of a gold-proud and barrow-dwelling dragon. The line reads drihtlic isern. Draca sceal on hlæwe “lordly iron. The dragon shall be in a barrow” (26). This closely parallels a similar line in Beowulf, which reads dryhtlic iren. Draca morðre swealt “lordly iron. The dragon died by murder” (892). Although the ending of the line is altered, the commonalities are nevertheless striking, especially since in both cases the alliteration stretches across two discrete semantic units. I have also tried in my translation and recitation to emphasize the poetics of this episode, especially the two rhyming b-verse half-lines, which emphasize the dragon’s demise. The first, draca morðre swealt “the dragon died by murder” (892), characterizes Sigemund’s killing of the monster as a crime, in its description of the slaying as morðor “murder” (892). The second, wyrm hat gemealt “the hot worm melted” (897), reiterates the dragon’s death at the hand of the hero, and emphasizes also the element of heat—otherwise absent from the characterization of the dragon in the Sigmeund-episode—though explicitly linked to the Beowulf-dragon, described as fyrdraca “fire-dragon” (2689) and ligdraca “flame dragon” (2334, 3040). 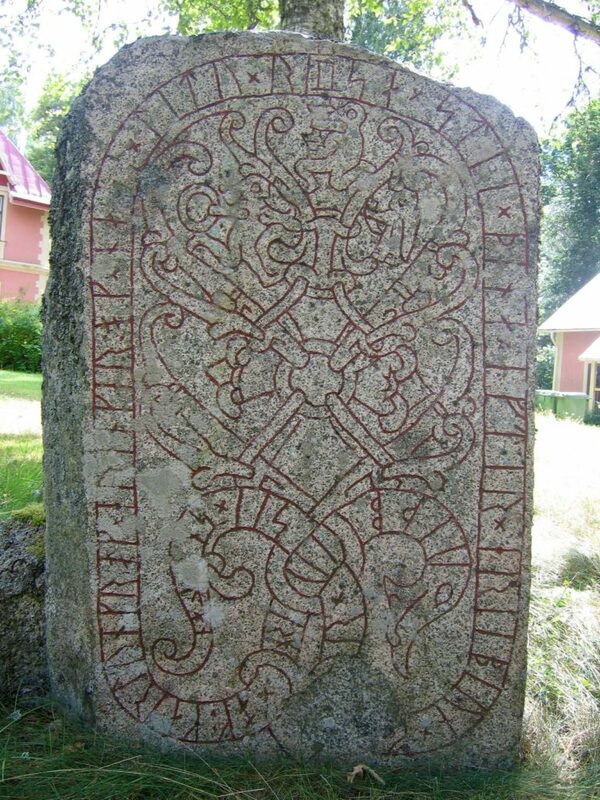 Vǫlsung Legend runestone discovered at Drävle (U 1163), relocated in 1878 to the courtyard of the manor house Göksbo, containing image of Sigurðr who thrusts his sword through the serpent. The Sigemund-episode is also enveloped by references to his ellendædum “valorous deeds” (876, 900), a compound that appears at both the beginning and end of the passage. 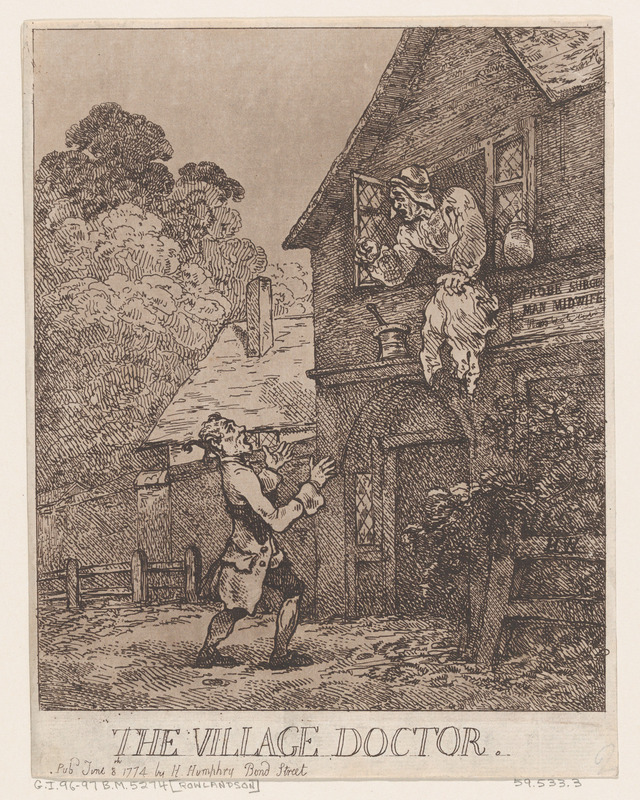 However, Mark Griffith has provided a detailed commentary of the episode, and he concludes that “The episode of Sigemund is more highly enigmatic, and its central figure much more problematic than received opinion has it” (40). Griffith observes the numerous pejorative terms used to describe the hero, perhaps most famously his characterization as aglæca “fearsome marauder” (893), a term used to characterize each monster in the poem, Grendel (159, 425, 433, 591, 646, 732, 739, 816, 989, 1000, 1269), Grendel’s mother (1259), and the dragon (2520, 2534, 2592, 2907, 3061), though notably also Beowulf at two key moments (1512, 2592). As Griffith points out, “if the term does have pejorative meaning, then this applies to both Sigemund and Beowulf” (35). This calls into question the merits of his heroism, and makes the reader wonder about the nature of his ellendædum, uncuþes fela “valorous deeds, much known” (876). The mystery introduced in this line is resolved when the Danish poet reports that þara þe gumena bearn gearwe ne wiston,/ fæhðe ond fyrena, buton Fitela mid hine “feuds and crimes, of which the the sons of men did not readily know, except Fitela with him” (878-79). Indeed we learn that his valorous deeds are characterized specifically as fæhðe “feuds” (879), a term associated with the Grendelkin’s feud with God (109), and especially Grendel’s mother’s vengeance (1333, 1340, 1380, 1537) as well as the dragons wrath (2403, 2513, 2525, 2689). We learn also that these deeds are explicitly fyrena “crimes” (879)—a term repeatedly associated with Grendel (101, 164, 750, 811)—who likewise performs fæhðe ond fyrene (137, 153). Indeed, troubling descriptions of the hero persist, as Sigemund becomes characterized as wreccena wide mærost “the most famous of exiles”(898), which calls to mind the exiled Grendel, described as mære mearcstapa “famous border-crosser” (103), depicting the hero once again in pejorative terms. I would argue that this bears especially on the final reference to Sigemund’s ellendædum “valorous deeds” (900), and specifically the parenthetical half-line at the end of the episode, which indicates that he þæs ær onðah “he prospered before by these” (900). 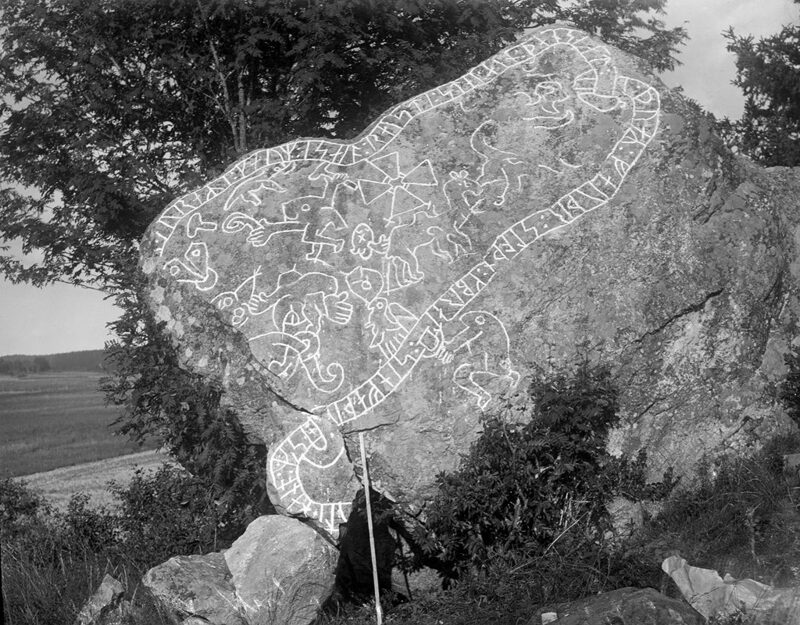 Vǫlsung legend runestone located at Gök (Sö 327), containing a runic text on two serpents that surround much of the Vǫlsung imagery, including a depiction of Sigurðr stabbing the serpent from below (photo from 1922). If Sigemund prospers through fæhðe ond fyrena “feuds and crimes” (879), what does this say about the warrior ethics displayed in the poem? Indeed, I would suggest that the parenthetical half-line he þæs ær onðah “he prospered before by these” (900) highlights how in the heroic world of Beowulf, the only way to thrive is by imitating monsters and engaging readily in fæhðe ond fyrena. In Beowulf, feuds and crimes result in the protagonist’s death and the subsequent genocide of the Geatish people—which mirrors Sigemund’s (and Fitela’s) annihilation of ealfela eotena cynnes “an entire race of giants” (883)—perhaps in part because Beowulf seems to adopt Sigemund as a role model and seeks to emulate the ellendæda of this aglæca. Abram, Christopher. “Bee-wolf and the Hand of Victory: Identifying the Heroes of Beowulf and Vǫlsunga saga.” The Journal of English and Germanic Philology 116.4 (2017): 387-414. Bonjour, Adrien. The Digressions in Beowulf. Basil Blackwell. 1950. Kaske, Robert. “The Sigemund-Heremod and Hama-Hygelac Passages in Beowulf.” Publications of the Modern Language Association 74 (1959): 489-94. Griffith, Mark. “Some difficulties in Beowulf, lines 874-902: Sigemund reconsidered.” Anglo-Saxon England 24 (1995): 11-41. Rauer, Christine. Beowulf and the Dragon. D. S. Brewer. 2000. In their 2013 guide to help physicians curate their online personas, Kevin Pho, M.D., and Susan Gay tell the story of a doctor who, upon Googling herself, finds out that she shares her name with an optometrist accused of deliberately blinding patients. In the age of WebMD, Twitter, and online rankings, the challenges of managing both one’s reputation and the endless stream of misinformation permeating the web have generated new ways of talking about medicine and its practitioners. Skepticism of medical doctors, however, has been around since long before the profession was recognized as such. The standardization of technical medical training in universities was a late development in the Middle Ages, in part because many academics considered the activities of wise women and barber surgeons to fall below the study of Aristotelian natural philosophy, astrology, and religious council. Even after universities across Western Europe began teaching hands-on medical procedures, they struggled to obligate patients, including aristocratic and royal patients, to rely exclusively on those with degrees. Well into the fifteenth century, it was inconceivable to mandate that English medical professionals be university-trained. This was because, first, the institutions that gave out these credentials in England, Oxford and Cambridge, were far removed from the most populated areas like London. Second, these urban communities were far too vast to be served by the handful of medical graduates. The works of two major fourteenth-century authors demonstrate that the skepticism and ridicule with which doctors are often treated to this day existed even as the occupation of the medical professional was still being defined. In his “General Prologue” to the Canterbury Tales, for instance, Geoffrey Chaucer heavily satirizes his Physician, who knows little of the Bible, dresses extravagantly, and reaps financial rewards from the plague. A trained alchemist, he uses his claimed expertise in the scientific properties of gold to benefit from its economic value: “For gold in physic (medicine) is a cordial,/ Therefore he loved gold especially” (1.443-44). Like so many of Chaucer’s professional academics in the Canterbury Tales, the Physician abuses his qualifications in order to line his pockets. William Langland’s B text of Piers Plowman anticipates the “General Prologue”’s criticism of the Physician. In the last passus, the personification Life seeks out a “phisik” to cure him of Old Age (B.20.169). 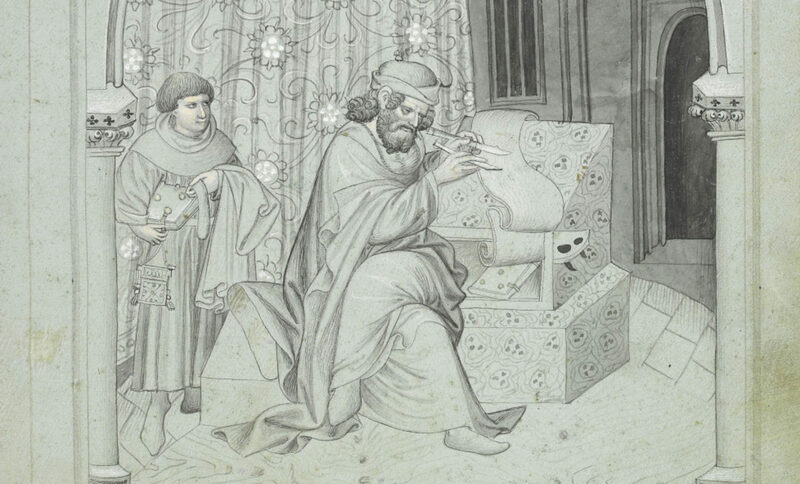 The “Physician with a furred hood,” to whom Life gives gold “that gladdened his heart,” is similar to Chaucer’s Physician in that, in his greed, he takes advantage of Life’s illness. He plays a greater role in Langland’s allegorical theology when it becomes clear that his craft obscures the need for spiritual healing. The “glass helmet,” or placebo, that he offers Life is an ineffective diversion from the true purpose of Old Age: to direct Life toward virtue and cast out spiritual despair (B.20.172). Just as the Physician of the “General Prologue” has studied a long list of Greek, Arabic, and other medical sources, “but little of the Bible” (1.438), Langland’s “phisik” transgresses in that he displaces spiritual action with medical practice. Make themselves masters men for to heal. And no leches (doctors) but liars, Lord amend them! In this passage, the Z maker is more concerned with the intellectual hierarchy generated by medical knowledge than he is with “fysyk” itself. He criticizes those without what he deems sufficient education, he applies the logic that the misuse of medicine can be fatal in order to encourage the exclusion of the untrained, and he adds to this sense of hierarchy by immediately asserting that “the clerk that can read” should mediate the Bible for his less educated audience. This passage indicates that understanding not just of the medical material, but also of the ethical implications underpinning it, must be mediated by a professional. The Z maker’s frustration is akin to that of many of today’s physicians when their patients diagnose themselves using pharmaceutical commercials and online forums. In the case of Piers Plowman Z, this tension is amplified by the integral nature of bodily and spiritual healing in medieval culture. Chaucer, Geoffrey. The Riverside Chaucer. Edited by Benson, L.D. and Robinson, F.N. 3rd ed. Boston, MA: Houghton Mifflin Co, 1987. Chen, Pauline W. “Doctors and Their Online Reputation.” New York Times, March 21, 2013. https://well.blogs.nytimes.com/2013/03/21/doctors-and-their-online-reputation/. Dumas, Geneviève, and Faith Wallis. “Theory and Practice in the Trial of Jean Domrémi, 1423–1427.” Journal of the History of Medicine and Allied Sciences 54, no. 1 (January 1, 1999): 55–87. Fuller, Karrie. “The Craft of the ‘Z-Maker’: Reading the Z Text’s Unique Lines in Context.” Yearbook of Langland Studies 27 (2013): 15–43. Getz, Faye. 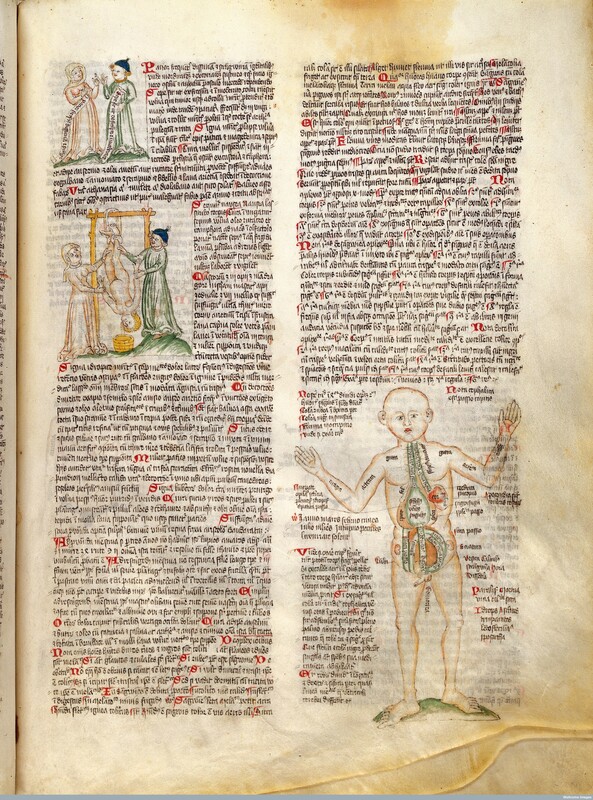 Medicine in the English Middle Ages. Princeton, NJ: Princeton University Press, 1998. Kerby-Fulton, Kathryn. “Confronting the Scribe-Poet Binary: The Z Text, Writing Office Redaction, and the Oxford Reading Circles.” In New Directions in Medieval Manuscript Studies and Reading Practices Essays in Honor of Derek Pearsall, edited by Sarah Baechle, John J. Thompson, and Kathryn Kerby-Fulton, 489–513. Notre Dame, IN: University of Notre Dame Press, 2014. Langland, William. Piers Plowman: The B Version: Will’s Visions of Piers Plowman, Do-Well, Do-Better and Do-Best. Edited by George Kane and E. Talbot Donaldson. London: Athlone Press, 1975. McVaugh, Michael. Medicine before the Plague: Practitioners and Their Patients in the Crown of Aragon, 1285-1345. Cambridge History of Medicine. Cambridge, UK; New York: Cambridge University Press, 1993. Pho, Kevin, and Susan Gay. Establishing, Managing, and Protecting Your Online Reputation: A Social Media Guide for Physicians and Medical Practices. Phoenix, MD: Greenbranch Publishing, 2013. Rawcliffe, Carole. Medicine & Society in Later Medieval England. Stroud, England: Alan Sutton Pub., 1995. Rawcliffe, Carole. Urban Bodies: Communal Health in Late Medieval English Towns and Cities. Woodbridge, Suffolk: The Boydell Press, 2013. Rigg, A.G., and Brewer, Charlotte, eds. Piers Plowman: The Z Version. Studies and Texts 59. Toronto: Pontifical Institute of Mediaeval Studies, 1983.